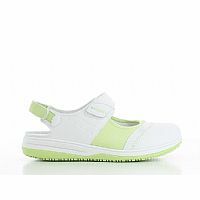 The model Oxypas,MELISSA is a sporty sandal, fully adapted to the needs of the healthcare professionals. 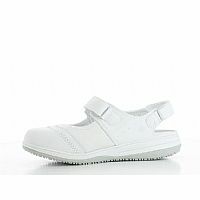 The adjustable velcro straps on the instep and the back of the shoe ensures a firm fit. 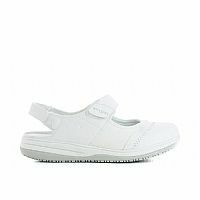 The middle part is lycra, wich gives the shoe flexibility. 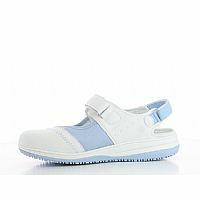 The Medilogic collection has an ultralight design with antistatic properties and a slip resistant outsole. The lining is in breathable Coolmax �. 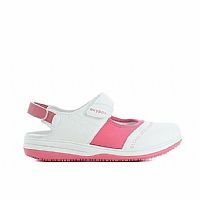 The outer material is synthetic leather and can easily be cleaned with a damp cloth. 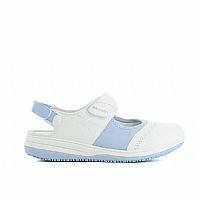 The anatomical shaped foot bed and outsole that at any point touches the ground, ensures a healthy support of the foot. This model has a 1.18 inch or 3 cm heel. Easy maintenance: The shoe can easily be cleaned with a damp cloth (not the parts in Lycra). 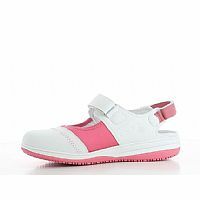 Synthetic leather: The outside of the shoe is firm, high end artificial leather. 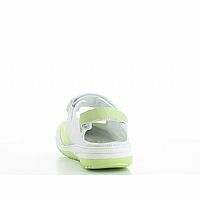 Lycra: The piece in lycra gives the shoe extra flexibility.